Very nice. That's a sweet setup. Very late to the game here ... and new to Peak Skier Zone. Found some great info. when searching for reviews of The Pulse, so thought I'd join. I skied the Phoenix from Hart as a primary frontside ski for 2 years and loved it. Been demo'ing many skis this season in the 76-82 mm width range, and just decided to go with the Pulse. Still in the plastic waiting to be mounted and hit the snow. Got lots of feedback on mounting position from the folks at Hart and am going with their recommendation at +2cm. Now looking for the right (and most cost effective) binding set-up. Don't need more than a 12 DIN binding at my 165 lbs., and definitely will be using these on more than just groomed ... ungroomed, bumps, glades. What do you recommend? 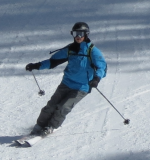 BTW, thanks for all who have posted about this ski ... just about the only place to find good, real-world info. about it! First, Hobbes -welcome to the Peak Skiers group. Please join any thread that is of interest, we are a group of enthusiastic skiers and good (I think) people. Our one rule is to respect others - pretty simple. All Hobbes pm'd me via the Epic forums for some thoughts on the Pulse and I sent him a link to this thread, along with an invite to join. We now have, probably, the largest group of Hart Pulse skiers anywhere, with him, me, High Angles, and Helluva (who has retired them). My recommendation was the Tyrolia/Head Powerrail bindings which are adjustable without remounting. I certainly support the Power Rail recommendation. I have them on all three pair of my skis, so i only lug around one pair of bindings (and two pair of brakes). You might consider mounting the Power Rails so they are centered at +1cm, and that way you can get +2 as well as back to 0 with the adjustment in the bindings (unless you have a boot sole length less than 300). Mounting the rails at default position probably won't allow you to move bindings forward to +2cm. Hi All. I found this forum when searching for info on mounting Hart Pulses. I recognized a few of you big dawgs and decided to join. The Hart Pulses 170s are fun! I mounted Head PRD12 powerrails so I can mess around with boot locations and allow my son and others to use them. As a point of comparison for location HighAngles, can you pull a tape from the tail to your +32mm BSC location? After reading other posts and corresponding with others (including Bob Barnes) +2 from the '469' mark sounded like the sweet spot. FWIW, As another trick for finding the arc center/narrowest part, lock calipers or other device to an arbitrary length less than the widest on the tail. Move towards the tails until it stops and mark. Do the same towards the tips and mark. Half between should be the center of the arc and narrowest part of the ski. Welcome to the Peak Skiers site. There are no big dogs here, just a collection of a few friends. I could not get that link to work. For those who do not know of Alpinnord, he runs an internet ski tuning website called Slidewright. If you need tuning gear, or other stuff, check it out. Reminds me that I need to get some all purpose wax soon. I miss your presence in the Epic tuning section. He also has some nice video about how to tune skis. You are welcome to post here anytime. Due to an inaccurate mounting line assumption for the power rails, my BSC ended at +3.5mm which worked fine, but +2 seemed more 'right' and today I'll try them back another 16mm just to see how it feels. I fixed the link and in addition to tuning, waxing and repair stuff we have ramped up binding mount and insert installation tips and products. LF = Low Fluoro. I just ran my Structuring Plane w/coarse stone over the the base a few times, followed by the steel blade. It was a mixed bag today. It was in the 50's, intense sun and like skiing in summertime, not springtime. The wet corn and packed groomers were fast. The mankey transforming, untracked snow was grippy as was plowing into sloppy crud bumps. I might try a more aggressive structure after the next storm. The move back from the +2 position was a regression and now playing with small increments around +2 is next. Another option I think will be fun to mess with on the Pulses is a radial base bevel after getting more miles and locked into a boot location. Alpinord (Terry) -- welcome to our little forum! I have seen your contributions on that other forum, and visited your shop's website. Very nice...some good stuff on offer. Your tuning videos have been quite valuable in past -- well done. No orders as yet, as I live in Canada. Send me a PM if you ship up here, and I'd be happy to order some tuning supplies and tools from you (there are a few things on my wish list). Keep checking in here, as your knowledge of tuning and all things technical will be a great asset. The more aggressive structure did not disappoint, although the snow wasn't as wet as last week. I could plow through manky snow better. There was a wind keeping the snow firmer and fast, so it was not apples to apples. The +2.8 position was as fun as the +2.0 position as far as I could tell. While getting more used to the stiffer Harts in various bump types (soft, firm & covered with death cookies) and other variables, the skis responded well and were solid and love speed on super firm snow through corn groomers. Just curious for those with PRD 12 bindings on the Pulses, what brake width you went with ... most places I found that have them in stock have no smaller than 88mm brake width. Other widths can be ordered if you find a friendly dealer. My Progresssor 800'a came with narrower brakes. I had to order wider brakes so as to use one set of bindings on all three sets of skis. I think the available sizes were mid 70'a, mid 80'a, mid 90'a and 105? But I can believe that 88 is the most commonsize shipped with the bindings.